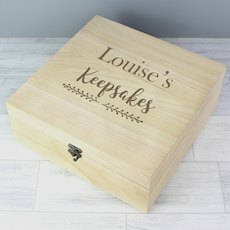 This Personalised Any Message Wooden Keepsake Box is a perfect practical gift that's well suited to almost any occasion! 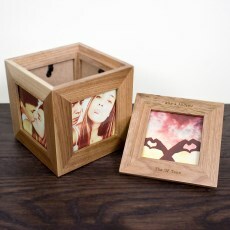 It's ideal for storing your precious memories. The box can be personalised with 2 lines of text with up to 15 characters per line (above the line) and 2 lines of text with up to 25 characters per line (below the line). All text will appear in upper case. 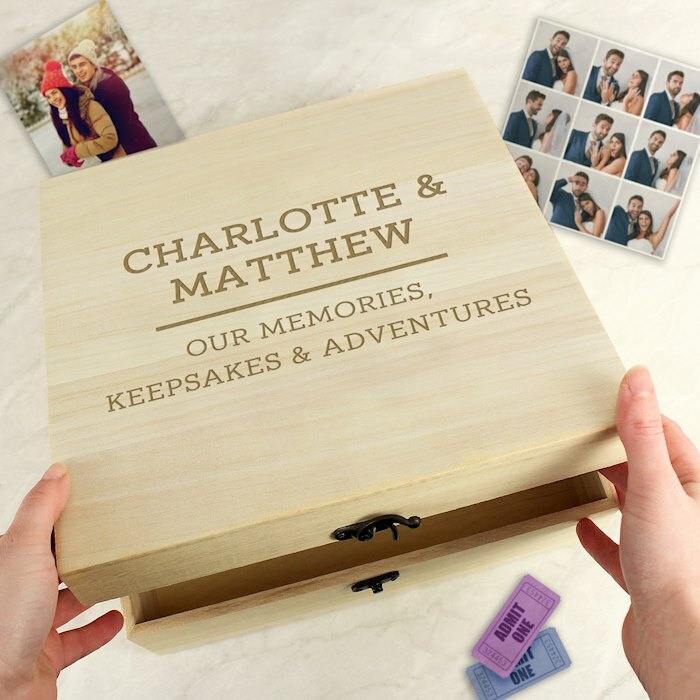 This wooden memory box is perfect for an assortment of small keepsakes including photographs, travel souvenirs, crafting supplies, jewellery or baby keepsakes. Ideal for Weddings, Birthdays, Anniversaries, Engagement, New-borns, Mother's Day, Father's Day. The box features a metal clasp and hinges. Please note that each box is crafted from natural wood and so may feature small imperfections and differences in grain, knots and colour. The wood is approximately 0.6cm thick. You have entered some of your message in uppercase, this may result in the text being difficult to read, and may even result in personalisation being missed off the product. We recommend avoiding uppercase on this product. You can still continue using uppercase, but we advise contacting us for more information about it. We've just spotted that you haven't personalised your gift... Please fill in the personalisation above, or click add to basket once more to confirm you would like the item left blank. You have entered a quantity over 1, please note that each item will be personalised the same. If you would like each item with different personalisation, please change the quantity back to 1 and add the messages one at a time. Please do not include spaces within the highlighted field above as this may cause a problem with the personalisation. Please crop the image you have uploaded. The above rates are per order, not per item. I loved the product and so will the person I bought it for. Thank you so much and I hope I can buy from here again. Arrived quickly - just what I wanted! Had an issue with the box at first but when I messaged the seller, I received a replacement box the next day! 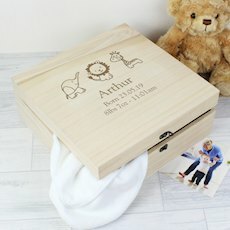 Great box, pleanty of space and at a great price. Exceeded my expectations really pleased. Would recommend. Fantastic, great that I could personalise the whole message and not just amend the name. Fab quality and good price too. 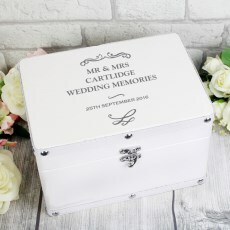 A really nice keepsake box, nice clasp, good quality print and good value for money. The box came very quickly and is a good size but the quality of the wood isn’t good very thin and flimsy! It is untreated wood which to be honest is a bit rough! I guess it wasn’t expensive so Can’t expect to much but I wouldn’t order again. 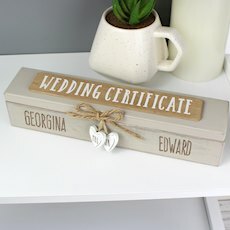 Lovely keepsake for special memories. Big enough to fit quite a bit in. Nicely personalised. 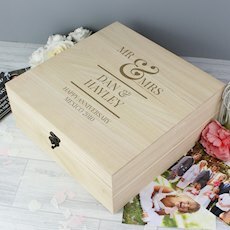 Lovely box , fast delivery and is as described on the website. Please note that all products carry a production time, which varies depending on the product. Products are dispatched as quickly as possible, but some naturally take longer than others. The below information is about the delivery services available, not including production times. To get a delivery date estimate for a particular product which includes the production time, the easiest way to do so is to click the 'Delivery' drop down on the product page, or add it to your basket where you will be given the complete delivery time-frame. This service is for non-priority deliveries and usually takes 2 days to delivery after dispatch, but can take up to 4. Please allow up to 5 days during busy times such as Christmas. Similar to 1st Class, Royal Mail aim to deliver your order the next working day from despatch. This is not 100% guaranteed, and if your order is urgent please take this into consideration. Same as above, but tracking will be available. Because the above services are not tracked, for peace of mind during delivery we recommend using this service when possible, especially if your order is particularly urgent. Our quickest service ensures production is prioritised, and your order is sent via Royal Mail 24 with tracking (described above), or by a courier when stated on the basket page. When despatched by courier delivery will not take place on a Saturday. All Royal Mail services deliver on Saturdays, but not Sundays or bank holidays. Our couriers deliver Monday to Friday. Monday - Friday 9:30am - 5.30pm. Please note we are unable to take orders over the phone.